MyVisitPlannerGR, is an intelligent web-based system aiming at making recommendations that help visitors and residents of the region of Northern Greece to plan their leisure, cultural and other activities during their stay in this area. The system encompasses a rich ontology of activities, categorized across dimensions such as activity type, historical era, user profile and age group. Each activity is characterized by attributes describing its location, cost, availability and duration range. The system makes activity recommendations based on user-selected criteria, such as visit duration and timing, geographical areas of interest and visit profiling. The user edits the proposed list and the system creates a plan, taking into account temporal and geographical constraints imposed by the selected activities, as well as by other events in the user’s calendar. The user may edit the proposed plan or request alternative plans. A recommendation engine employs non-intrusive machine learning techniques to dynamically infer and update the user’s profile, concerning his preferences for both activities and resulting plans, while taking privacy concerns into account. The system is coupled with a module to semi-automatically feed its database with new cultural activities in the area. 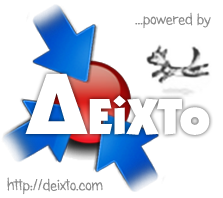 Please check our Scientific Page for the presentation of the related paper presented in the 8th Hellenic Conference on Artificial Intelligence, (SETN-2014), Ioannina/Greece, May 15-17, 2014. This entry was posted in News and tagged DEiXTo, DEiXToBot, extraction, myVisitPlanner, SETN-2014. Bookmark the permalink.